The clock is ticking down and you can’t find the blacklight clue that will lead you to the last key… your friends and family are tossing the drawers and papers again, desperately trying to find the six-digit code for a lock, and the seconds are disappearing fast. Finally, it all comes together, and you open the door with thirty seconds to spare! 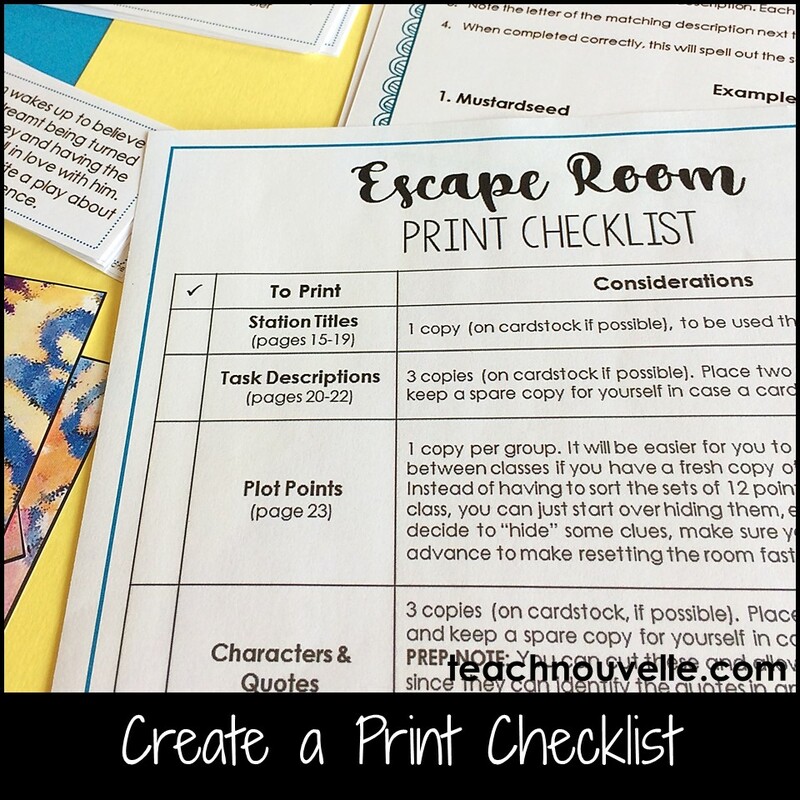 I’ve been obsessed with Escape Rooms ever since my family first tried one at Christmas, and I’ve been looking for ways to bring this experience to the ELA classroom ever since. 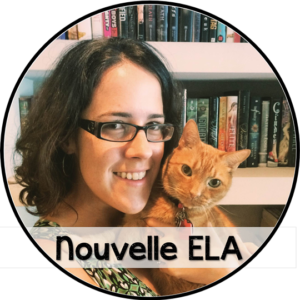 Read on to find out how I make and use Escape Rooms in ELA, and how you can design your own. An Escape Room or Breakout Box are two versions of a collaborative puzzle game. Players work through a series of tasks to reveal ‘keys’ and get information for the next activity in the game. They win when they’ve completely all of the tasks, found all of the keys, and verified their win. The easiest way to present this kind of activity is a Breakout Box. Put students in groups of 4-5 and give each group a copy of all of the tasks and an answer sheet. Students receive everything at the same time, and a group “wins” when they hand you a complete answer sheet with the correct keys. You can give a small amount of credit to the winners, or to the top three groups. This will keep students from sharing answers AND from stopping their work as soon as the first team wins. A true Escape Room allows a group of students to assess all four tasks, and divide and conquer according to their strengths. In this model, you’ll set up the tasks as stations throughout the room and permit students to play through them simultaneously. The winning group will still be the first to present you with all of the keys, but the activity will involve more movement and energy and all that that entails. I’ve built three Escape Rooms for ELA now, and here’s the process I follow. I’ve decided not to deal with physical locks for now because I only have a few minutes between classes, and the locks would need to be manually “reset” between games. Therefore, I work with an Answer Sheet where students write the codes they find. Decide how many topics you want to include, and whether or not you want students to do any writing. When I was designing my Romeo & Juliet Escape Room, I knew that I wanted to include tasks about plot, characters, important quotes, and a close reading activity for my 8th graders. When I got to A Midsummer Night’s Dream, I knew that I wanted my students to write about theme. The last activity in this room reveals a quote that students sit down to write about after they complete the game. You don’t have to write the activities yet – just have a general idea of your topics. Next, decide what keys (or codes) your students will find. For example, I had the vague idea when I was building my Romeo & Juliet Escape Room that I could use the act and scene numbers from important quotes to create the key. Students would transform a quote from Act 1, Scene 1 to “11” on their Answer Sheet. Another example of a key would be letters that spell out a code word. I use this with my Close Reading passage in my A Midsummer Night’s Dream Escape Room – the correct answers to the multiple-choice questions spell out an important word in the play. How much space do you have? How much movement do you want at one time? What noise-level do you want for your activity? In my Back-to-School Escape Room, I decided to hide letters by important supplies in the room. Students will receive riddles that will lead them to these supplies, and then they’ll pick up the Letter Cards. These letters unscramble to spell a word. Video: Take a look inside my BtS Escape Room! I also learned this trick from Escape Rooms I’ve played with my friends and family: if there’s something you don’t want students to touch, write “NO!” or “TRY ELSEWHERE” on a piece of masking tape on the object. A teacher-friend of mine gave me this great idea for managing student participation. If you have one student who’s doing too much of the team’s work, tap them out for a set amount of time. 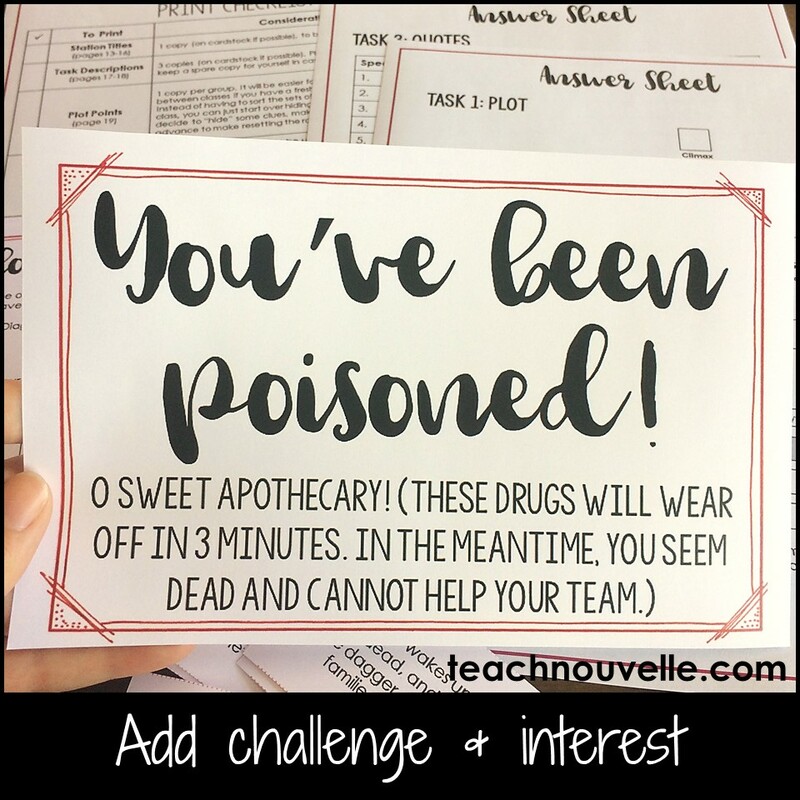 In the Romeo & Juliet Escape Room, I use Poison Cards to have a student sit out for a few minutes. Then, the rest of the team is forced to pick up the pace. You can also add writing as an extension of the activity. After students complete my Back-to-School Escape Room, I’ll have them write about one of the Growth Mindset Quotes they uncovered in their last task. 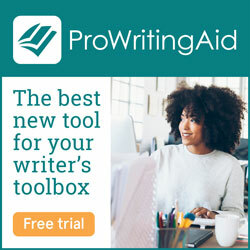 Just make sure to do allow them to “win” before starting the writing, or else you’ll get short and choppy answers. At this point, you’ve got a visual in your head and you know what you need for each task. 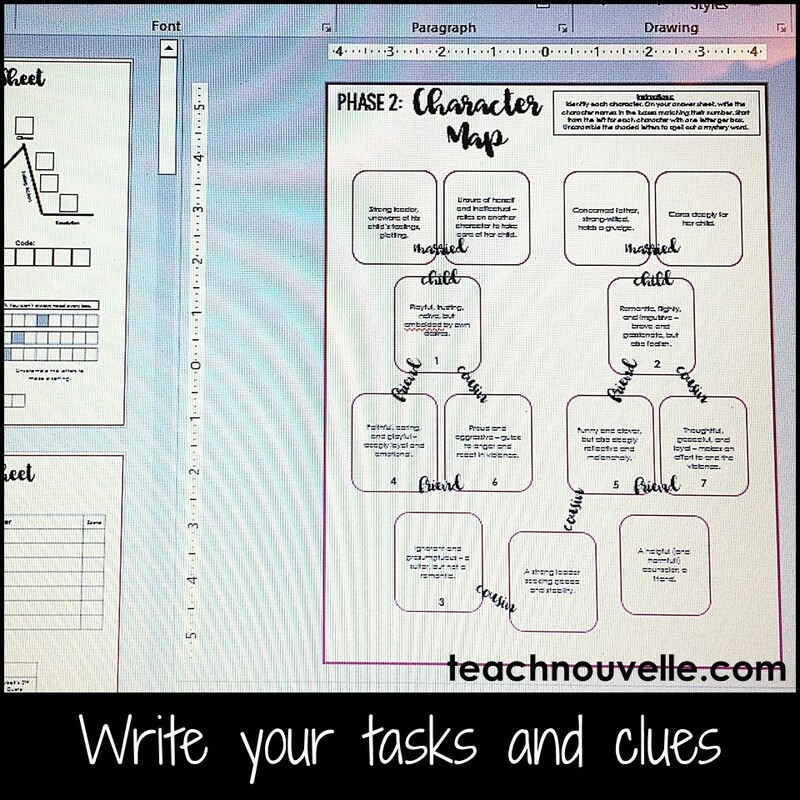 Write out each activity and make any clue cards you’ll need to hide for students. Make yourself a Print Checklist for each piece of the activity. I write down each item to be printed and how many copies I need. I also go ahead and imagine how I’ll “reset the room” between classes and write this down, too. It’s a good idea to test a room before bringing it to students, so run through it with a spouse or a friend if you can to make sure that everything works. When you finally present this to your students, let them struggle – it’s totally worth it! In the end, they’ll have a fun, collaborative experience that will fuel them through the tasks and build their problem-solving. Show me your Escape Rooms, friends! Use the hashtag #EscapeRoomsinELA and tag me on Instagram @nouvelle_ela. This is such a fun idea! You wouldn’t happen to sell materials for escape rooms you have made? I might be interested in buying a packet if they suit my class needs! Thank you so much for all your great work and ideas! 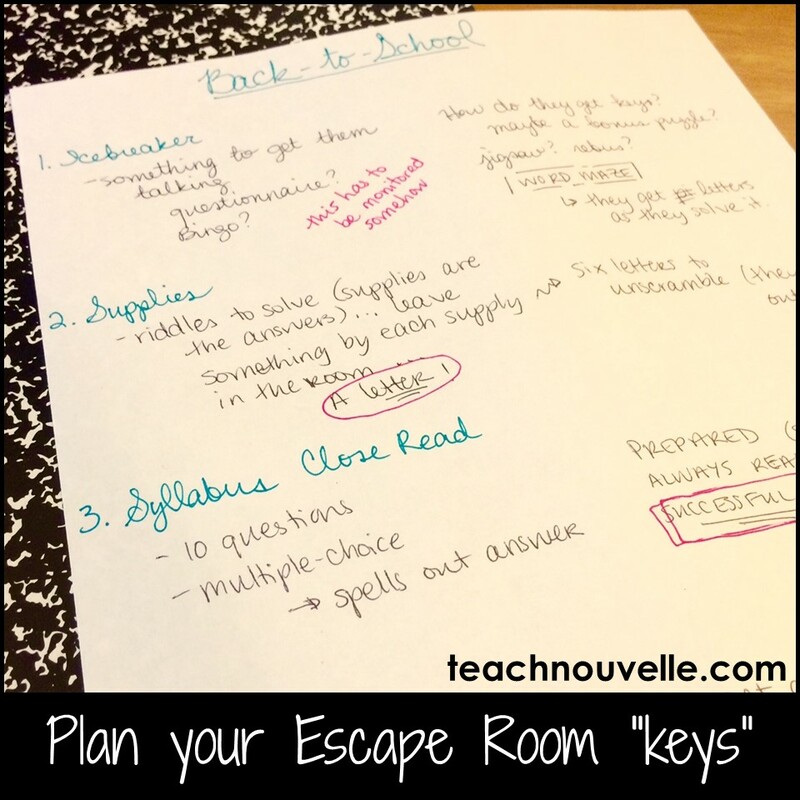 I’m looking forward to trying the escape room in my ESL lessons. I am interested in creating an Escape Room activity for identifying cited evidence and analysis. Would this be feasible? Absolutely! You could create different tasks for different types of cited evidence or different ways to support analysis. Anything that has a discrete correct answer works well for an Escape Room. If you want to have students connect what they’ve learned in a supported analysis of their own, that would be a follow-up activity.